Heidi R. Kling's Author Chat: With...Shana Norris! us a bit about it. I'll assume it has something to do with blogging, which us here perusing LJ know something about. Thanks, Heidi! I'm really excited about the release! 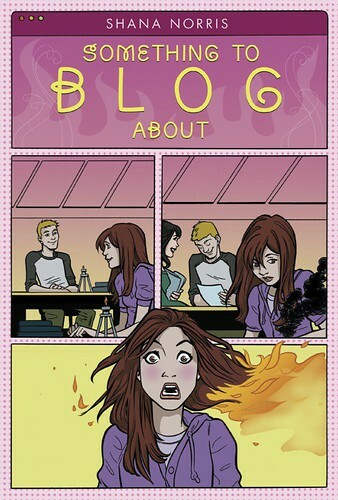 SOMETHING TO BLOG ABOUT is about a fifteen-year-old girl, Libby, who starts a secret blog after she burns half her hair off thanks to a run-in with a Bunsen burner. She starts writing about her secrets and her friends' secrets, but then she gets into a bit of trouble when the blog is found out and posted all over her school. How did you come up with the idea for your novel? Have you been blogging long? I started my first online journal in 1996, when I was sixteen. At first I used a pen name so no one would be able to find me, but then during college I started writing as myself. Unfortunately, some of my classmates found my blog and secretly read it. I had written some things about my classes and people I knew, so it was very embarrassing when I found out they were reading it! Thankfully, my incident didn't have all of the repercussions that Libby's does in my book, but it did help inspire SOMETHING TO BLOG ABOUT so some good did come out it! Do you ever have a hard time coming up with ideas for your blog? Yes, very often! Blogging is kind of hard because you want to write something interesting that will keep readers coming back. I'm sure no one wants to read about my adventures in grocery shopping, LOL. Tell us about your writing-publishing journey. How long did it take to write and then sell your novel? I wrote the first draft of SOMETHING TO BLOG ABOUT in exactly three weeks. I'm usually a fast writer, but that was still REALLY fast for me. I had created the characters ten years ago and they had been just bouncing around in my head all that time, waiting for the right story. So I loved the characters and I knew them well enough that I could just sit down and let my fingers fly. Then I revised for a few months and after that I started trying to find an agent. It took me right at eleven months to get an agent, and then seven months later we got the offer from Amulet Books. So it took almost two full years from the time I first wrote the book until the offer. Any tips for unpublished writers out there? books. Then start submitting your work to agents and editors, and don't give up! I got my agent right when I was ready to put SOMETHING TO BLOG ABOUT away in a drawer and give up on it. You never know if the next time you send your work out might be the acceptance that you've been waiting for. If memory serves, I think you like TV as well. What are your favorite shows? I do love TV! But I have a reputation as a Show Killer because it seems like whenever I really get into a show, it gets canceled. (My So-Called Life, Joan of Arcadia, Veronica Mars...) The shows I'm hooked on right now are The Office, Chuck, House, Criminal Minds, and Gossip Girl. If you could write on ANY TV show what would it be? I'd love to write for The Office! I love the pranks Jim plays on Dwight and I think it would be so much fun coming up with those. Are you working on a new novel now? Can you tell us anything about it? I am currently working on my second book. I'm afraid of revealing too much because I have a bad habit of losing interest in a book if I talk too much about it before it's finished. But I will tell you that it's a modern day retelling of a very old story, set in high school, and involves a lot of pranks. I'm having a lot of fun writing it! It should be out early next year and later this year I'll reveal full details about it on my website. Thanks so much for coming to see us, Shana! PLLLLEEEEEEAAAAASE write another "something to blog about" book.....if not in progress...I guess. That was the funniest book EVER!!!!! PLEASE write another something to blog about novel. PLEASEEEEEE!!!!! that was a really good book. it was also rreeeaally funny. ow. either im hungry or it made me laugh to hard. actually im just hungry. ow.